Panamarenko is an exceptional and unclassifiable figure in contemporary art. Artist, engineer, poet, physicist, inventor and visionary: for thirty years Panamarenko has pursued a singular course of exploration of space, movement, flight, energy and the force of gravity. His work, fusing artistic and technological experiment, takes many forms: aeroplanes, flying carpets, cars, flying saucers, and submarines. His spectacular structures, at once familiar and strange to us, are both playful and inspiring. Despite his extraordinary retrospective exhibition at the Hayward Gallery in 2000, Panamarenko remains little known in Britain. His sculpture-machines point to utopian dreams of effortless flight, stimulating thoughts of epic imaginary voyages. Liberation through flight is an enduring source of stimulus, and yet despite his preoccupation with movement and travel, he continues to live and work in his hometown of Antwerp, and rarely leaves Belguim. Panamarenko's vehicles highlight the physical and mental effort needed for flight. 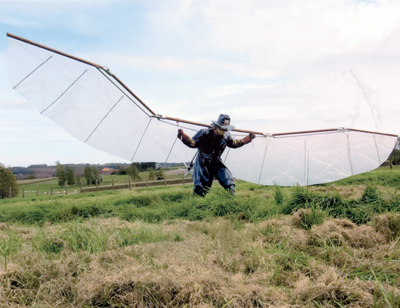 His man powered aircraft using self-inflating wings and propelled by arm movement alone, is at once ridiculous and quaint, echoing the early days of aviation. Veering between humour and nostalgia, the work demonstrates the human will to succeed, despite almost certain failure. Panamarenko's work is heroic; Making his machine-sculptures, he seeks to unleash technology from the confining limits of science. Harnessing the imagination, his work challenges the impossible, and brings it into the realm of the everyday. Taking inspiration from Pieter Bruegel the Elder's 'Landscape with the Fall of Icarus', 1558, Panamarenko observes how the young boy's failed attempt at flight takes place amidst normal everyday activities. Combining desire and the improbable, these objects apparently facilitate, whilst recognising the futility of, man's attempt to fly. Many of his large-scale models/sculptures/prototypes are patched, mended, seemingly held together by the artist's belief in his own project. Panamarenko belongs to the generation of post-minimalist artists who were determined to raise the question of 'form' as a conceptual issue. Like his friend Joseph Beuys, Panamarenko believes that there is a greater function for art beyond the museum. Opening out approaches to the visual arts, since the 1960s he has developed his own unique vision. This will be his second exhibition at Gimpel Fils. At the moment Hannah Brown is searching for her perfect hill: A softly rounded, gentle rolling hill, steeper on one side than the other and standing alone with a cluster of trees on top. Working within and against an omnipresent legacy of the English landscape tradition, Brown is interested in the various manifestations and interpretations of the English countryside. Going in search of the picturesque, her work meditates on the cliché of the 'green and pleasant land', its idiosyncrasies and eccentricities. In looking for the perfect vista, Brown identifies key components of a classic landscape image: fields, hills, trees, hedgerows. These images, produced as paintings, manipulated digital prints, and painted-over photographs, are combined with sculptural objects such as a plaster boulder or a wooden fence. The painted surfaces of Hannah Brown's work problematise the truth of what is real and not, and point to the human construction of our environments. Just as in real life, in order to access the landscapes offered in Brown's pictures, audiences have to negotiate boundaries that maintain division. Moving around the sculptural elements of each work before arriving at the picture reminds us that for most city-dwellers, experiences of the countryside are meditated. Brown gathers her imagery by taking photographs on the train journey from London to the West Country or by driving around small country lanes, slowing at every gateway to see what the view is like. Consequently the majority of her images are framed, as though by a train or car window, so that the land is already at a distance. Historically this division has enabled a situation in which the truth of the landscape is jettisoned for a romantic version of it. Hannah Brown received a First Class BA Hons, in Fine Art Sculpture from Central Saint Martin's College of Art, and recently completed her Masters at the Royal College of Art, London. She has exhibited in numerous group shows, including: Day-to-Day Data, touring Angel Row Gallery, Nottingham, and Aspex Gallery, Portsmouth; Between Place and Space, Blythe Gallery, London; and Notion Nanny Tea Party, Studio Voltaire, London. This is her first solo exhibition. As part of Gimpel Fils continuing commitment to contemporary art, Downstairs opened in November 2004 as a dedicated project space, showcasing challenging and experimental artwork. Downstairs has its own exhibition programme comprising solo shows by emerging and established artists who have not previously exhibited at the gallery.